Efficiency is a word Arron Nerbas of Nerbas Brothers Angus, near Shellmouth, Man., uses often when describing his family’s moderate-framed Angus cattle and their forage-based farming operation. Originally his dad and uncle farmed together, and that’s where their ranch name came from. “My dad, Gene, is still involved with our ranch and my mom, Cynthia, is the financial bookkeeper. My brother Shane and I are the third generation,” says Arron. 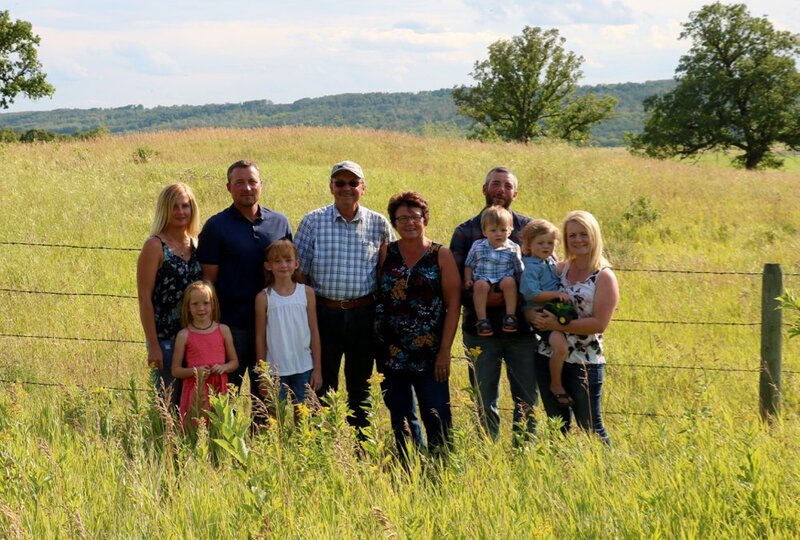 After Arron and Shane returned home the herd expanded from the 250 cows their father had to about 600 cows and has remained at that number for about 12 years. “This is a comfortable number for us, based on the land resources, people resources, etc. I don’t think we will grow the herd any bigger unless something changes,” says Arron. 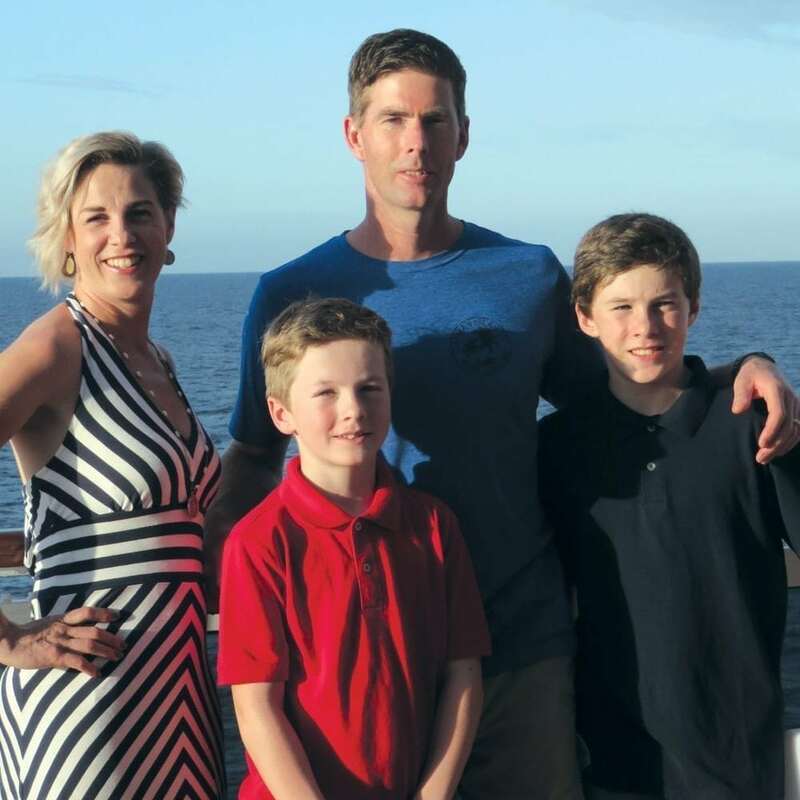 With his dad nearing retirement, expansion is not a short-term goal, he explains. A long time ago they used some Hereford bulls, but there hasn’t been anything but Angus on the ranch for the past 25 years. The commercial cows are practically straight Angus because they’ve been bred that way for so long, with no other breeds introduced. A small herd of registered cattle was started some years back with the idea of producing bulls for the commercial herd. The commercial cows are like purebred Angus, just without papers, and the registered herd are almost like commercial cows with a pedigree, because they are all managed the same. 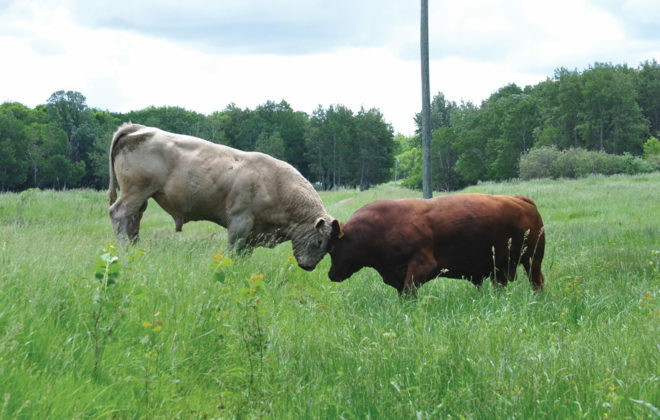 “The only difference is that the registered cows have pedigrees and lineage, and we use them to influence and introduce new genetics over time,” Arron says. Knowing the lineage helps when selecting a complementary or completely new bloodline. 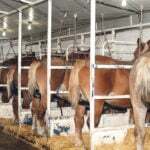 Their registered herd was started in the early 1990s. “We hadn’t really intended to get into the purebred business. We bought some purebred Angus heifers as 4-H heifers and our purebred herd grew from there. 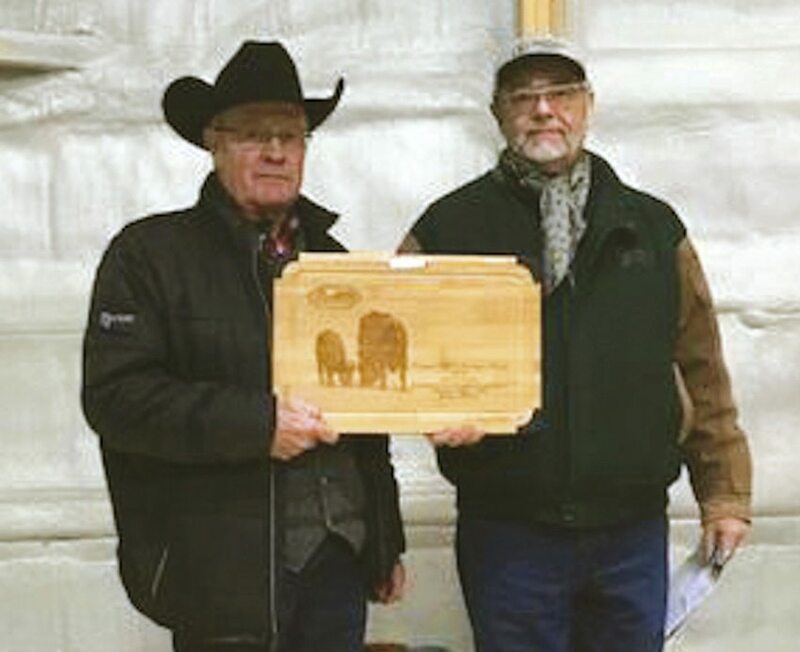 We were not finding what we wanted for herd bulls at that time so we decided to find bloodlines we liked and breed our own,” he says. The Nerbas Brothers try to provide their customers with bulls raised the way they run their own cattle. On the flip side of that challenge, the Nerbas Brothers are now trying to provide their bull customers with bulls raised the way they run their own cattle. “We are very transparent about how we develop bulls, and if this fits with the system our customers want, that’s great. We are not trying to compete in the mainstream market; that’s not our goal. 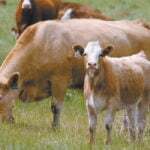 When you have smaller-frame cattle and are not feeding them like a feedlot animal, there is no point in trying to compare numbers,” he says. People who are not familiar with smaller-frame cattle and how these cattle are raised will also not really know what they are looking at when they see these grass-efficient cattle. There are more and more producers today, however, who are recognizing this value and trying to move their herds in this direction. “The way the industry has gone in the past 15 years, some things are changing. 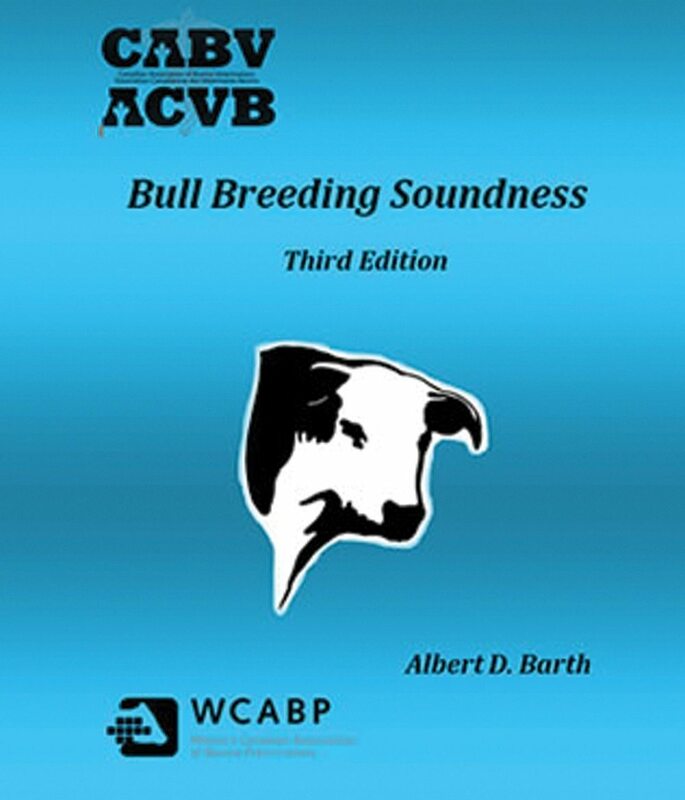 When we had BSE, there was some consolidation of herds and many people with small herds got out of the business. The average herd size in our region, for instance, has gotten larger. The tendency then changes to lower-maintenance-type cattle. 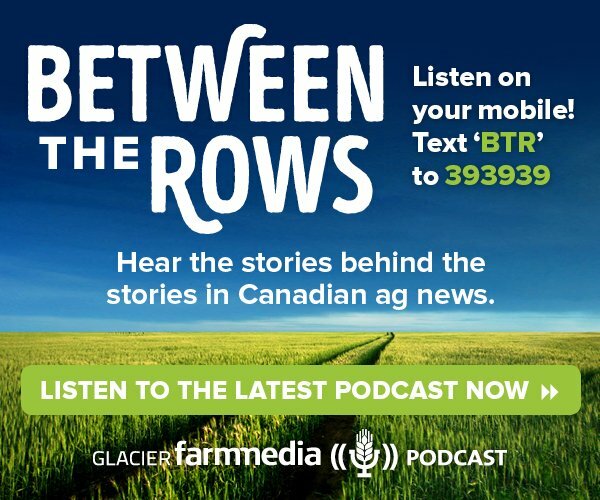 A lot of guys with only 50 cows were calving in January, and in a small herd you can make that work, but it’s a lot harder to calve out 300 cows in January,” Arron says. “Today there are more producers looking for a different type of animal that fits a different system. We realize, however, that we are still a niche provider; our cattle don’t appeal to everyone, and we’re okay with that. We are just trying to find customers who are looking for what we are providing. This is how we target our product,” he explains. “We don’t have a production sale; we just sell bulls off the farm on a first-come private-treaty basis. 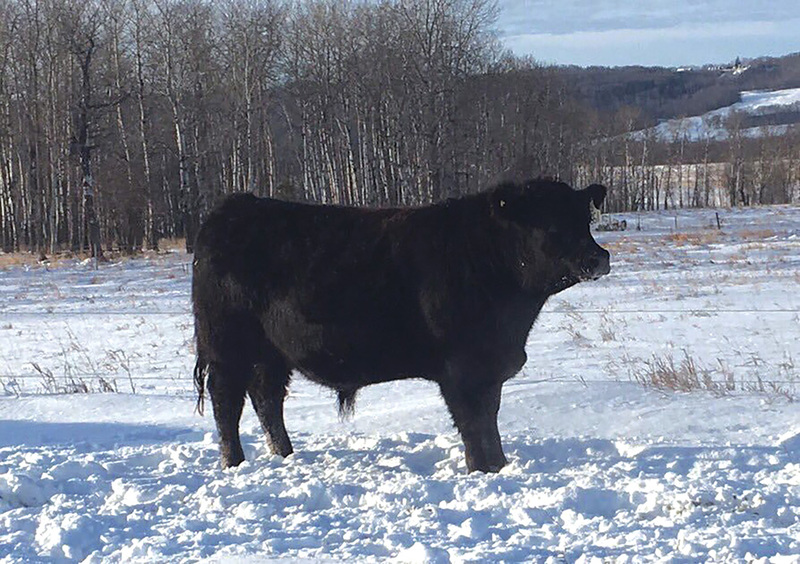 “Years ago we put ads in the paper and guys would come look at our cattle, and often our bulls weren’t really what the guy was looking for, yet we still had to spend four hours with him. 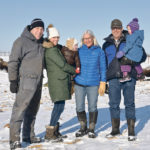 It’s better if we can market ourselves in the right way, to the right type of customer.” Then there’s more chance those customers will buy bulls because they already know — and are interested in — what this ranch is doing and this type of cattle. 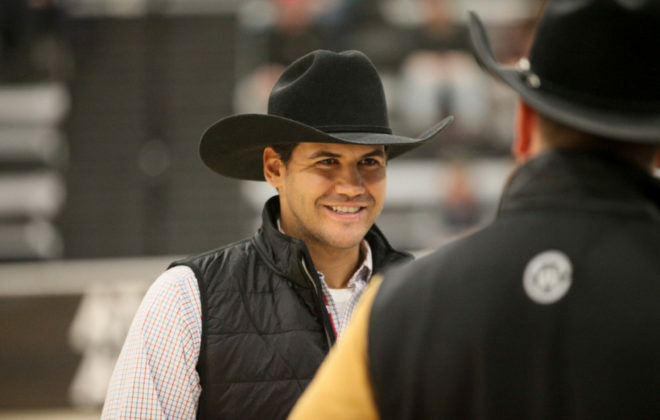 “Our goal with our cattle and with everything we do is to be efficient, so we want to attract people who have a sincere interest and are like-minded. We want a cow that can do everything you want her to do, and do it on her own, because cattle can do this if you have the right type of genetics,” he says. This often means letting them adapt to more natural conditions without pampering, and letting nature help you sort and cull them. “You first select the phenotype you think will work for you, and then put those cattle to work in your system. You keep fine-tuning the selection and culling, based on how they perform. Some cattle will do it better than others. The bulls we are selling have already gone through this process. It’s not just genetics. 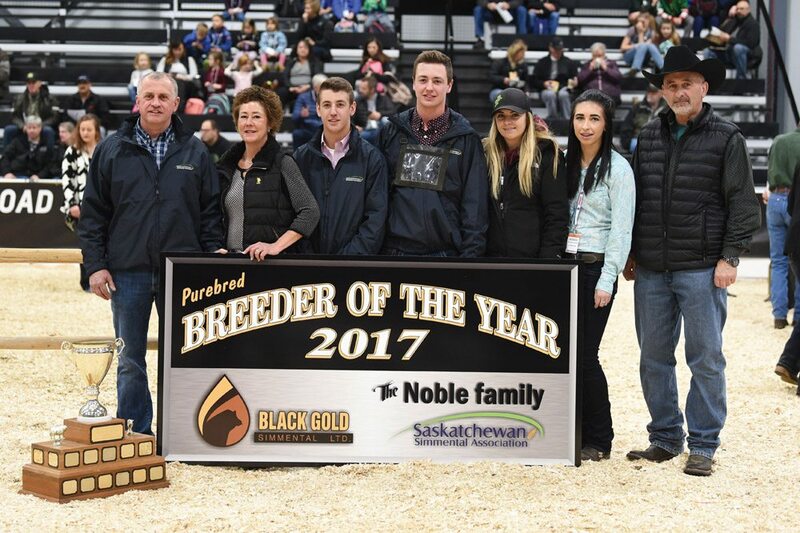 We have already put the selection pressure on the cows that produced those bulls; they are the result of several generations of selection,” Arron says. “We look at our cows as not just cows, but also as our machinery and employees because they harvest the feed. With every mouthful of feed, we want to reduce the need for machinery as much as possible. Every time you put a piece of machinery between the cow’s mouth and the forage, it costs time and money,” he explains. 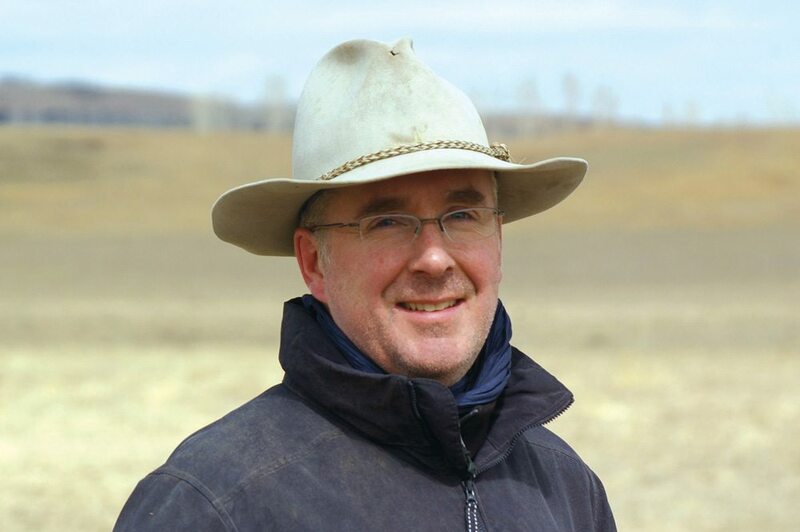 “The real reason we have been able to double our production is because of the cows. We have manipulated the system to only allow the cattle on a certain piece of land at a certain time, but they are actually doing the work. Their impact on the forage species and the ground is what makes it more productive over time. We are just guiding the animal impact and putting it where we need it, making the cows do the work,” he says. The Angus cattle they started with were fairly efficient, but bigger-framed than the cows they have now. The smaller cow weans off a greater percent of her own body weight than a larger cow. “This is the important thing. With the forage resource you can only have x number of big cows, or 20 per cent more smaller cows. We think it is more efficient with a smaller animal. Our cows today weigh about 1,250 on average. In earlier years their grandfather and father had a diversified operation — some grain, pigs, chickens and a dairy cow. “My father transitioned to a cow-calf beef operation. My brother and I went to university in Winnipeg and then we both worked on other jobs, and later came back to the ranch. Our family slowly added to the land base, doing it strategically. It is fairly important to us to have adjoining land, especially from a rotational grazing standpoint.” It’s easier to move the cattle to a nearby pasture than have to haul them somewhere. Today they have about 4,000 owned acres for hay and grazing and 1,500 acres rented mostly in grazing land. Arron and Shane took a holistic management course in 2005, and their parents took it the following year. “The way we operated our farm was already following many holistic principles; we were spring calving, range feeding, etc. We didn’t have to change much in what we were doing, but holistic management brings a lot more discussion to the table. It’s not just about the livestock or the land. It involves your financial planning as well, and ties everything together,” he explains. 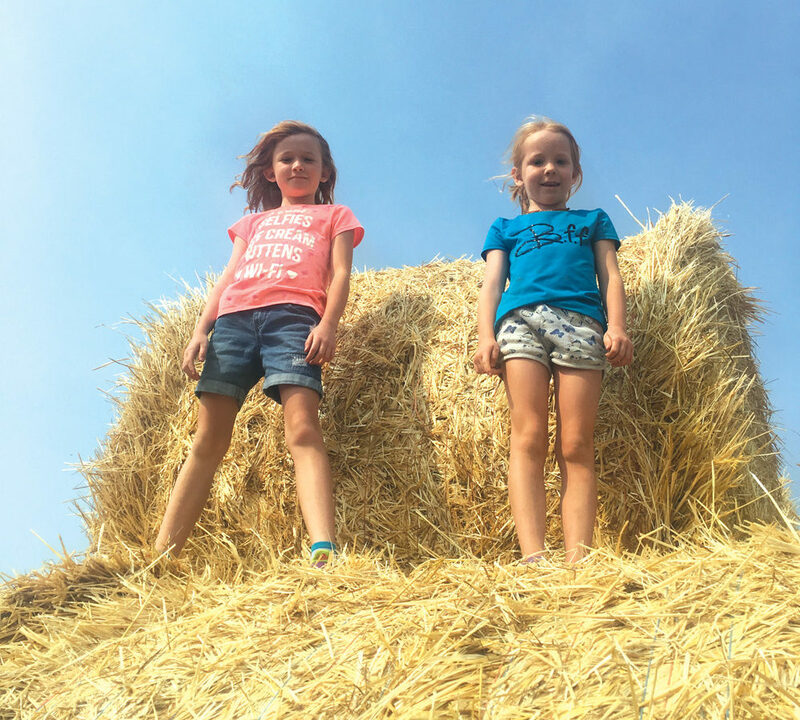 Daughters Emerson and Hailey playing on straw bales. Having all partners of the operation on the same page was very important. “When you have discussions, even on a daily basis, it helps you see the big picture and realize that the end goals are the same for everybody,” Arron says. 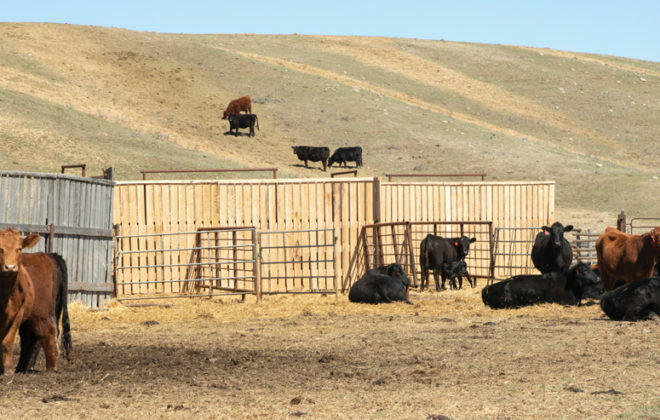 “One thing we implemented shortly after we took the course, and something we were not doing a good enough job on, was management of our grazing lands in terms of rest and recovery. Utilizing a grazing plan was very important to us, to make the land healthier long term. In doing that, we’ve increased our production on our grazing land over two times what we had originally,” he says. The plan involved putting up more cross-fences, increasing paddock numbers and making sure they had the water resources to handle the needs of the cattle when they began moving them through multiple paddocks in a planned fashion. The Nerbas cattle are not pampered. 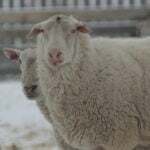 “We bale graze in winter, and our goal for winter feeding is to bale graze for only about 120 days. We want the cow to be out grazing, herself, for about two-thirds of the year, with less reliance on hay. We do a pod-style bale grazing system, setting the bales out ahead of time, and then giving the cattle 21 days’ feed at a time,” says Arron. “We strip all the twines and net-wrap off those bales prior to freeze-up and then just move the cows into that area and they are fine for the next three weeks. This works very well in our climate and in our management system. It takes about 1.5 minutes per day to feed 600 cows, and that’s without a tractor. That’s the average time it takes (us) to move those cows every 21 days,” he explains. The cattle are very content with this feeding system and are not stressed or waiting to have feed brought to them every day. “We’ve never had any health issues. The cattle take care of themselves,” he says. Some of the hay is put up on their place and some is purchased. “Right now we are purchasing about two-thirds of what we need, and making about 1,000 bales ourselves. We have a valley that was prime hayland, but there has been some flooding in that area that made it unpredictable. The hay grass species flooded out over time and the forage reverted to a wild-type hay. So now we are only haying some of that land and grazing the rest. We need better forage than that for winter hay. Even if we wanted to hay all of that ground, it’s a coarse hay that would need to be supplemented with protein,” he says. “We made the choice to outsource and purchase some better-quality hay and just feed some of our poor-quality hay to mix with it. The primary reason most people start to bale graze is to reduce labour when feeding, but a larger benefit is the soil improvement and increased forage production. When factoring in the costs of production or wintering cost of the cows, you should deduct a portion of the cost of the bales — in terms of fertilizer and improving the land. People need to recognize that benefit,” Arron says. Some people think that any hay that is not cleaned up by the cows is wasted, but the hay that is not eaten serves as litter and fertilizer along with the cattle manure. Waste varies a lot, and can be minimal, depending on the quality of the hay and the way the bale grazing is managed. 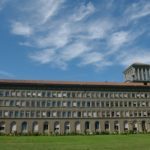 “Our waste is minimal. 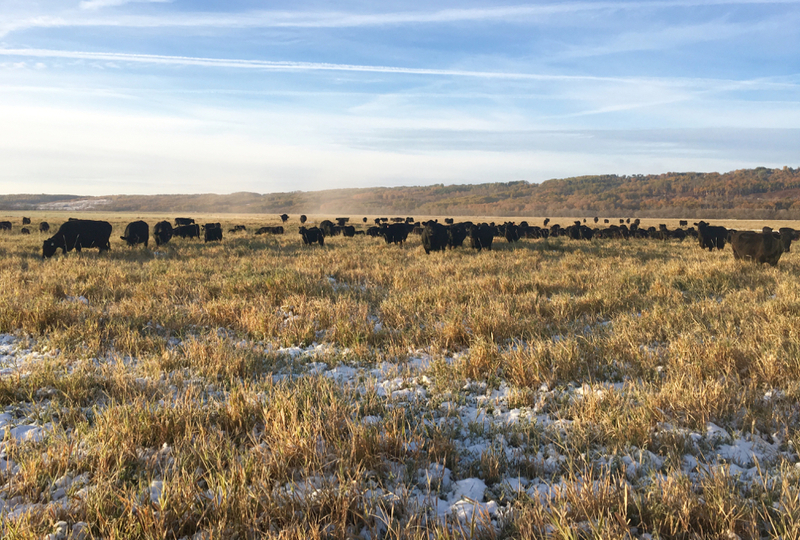 We found that if you do the bale grazing right, and balance it with the right type of cows and the right type of feed, they clean up most of it. We experimented with greenfeed and more grassy-type hay, but an alfalfa-grass mix works best and they eat nearly all of it. Greenfeed is stringier and they waste more. The bales tend to pop and break apart, and after the cattle have tromped, pooped and bedded on that hay they don’t clean it up as well. Bales that are good-quality grass-alfalfa tend to hold together better and the cattle eat into them without pulling out so much hay. The bale looks like an apple core. 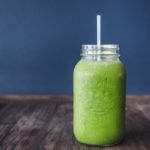 They eat in around the edges, leaving a muffin/mushroom-shaped top, and then that falls down and they clean it up, too,” he says. For more on Nerbas Brothers Angus, visit nerbasbrosangus.com or follow them on Twitter (@NerbasBrosAngus).